Sic pagina [continued from the previous page] jungit amicos. * Prov 10:27: Yir’at YHWH tosif yamim. Vulgate: “timor Domini adponet dies et anni impiorum breviabuntur”. Vocalisation is incorrect in one place, as compared to the Masoretic text: the first vocal of “yamim” is kamec in the Masoretic text, while patach in the album. Accents are missing in the two words in the middle. * 1Tim 4,12: Vulgate: “nemo adulescentiam tuam contemnat sed exemplum esto fidelium in verbo in conversatione in caritate in fide in castitate”. In Halle of Saxony, on June 4, 1712. [at the bottom of the page, written through the two pages:] Thus pages unit friends. Lőrinc Sérczi begun to learn in Gyulafehérvár, in 1708 he became a senior. He attended theology at the university of Halle in 1711, and from 1712 in Franeker. 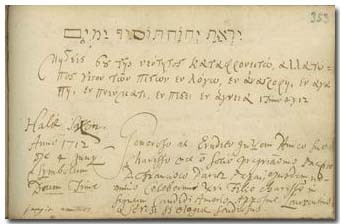 Lőrinc Sérczi wrote in the album in Halle, on June 4, 1712, encouraging his companion to exemplary life. Some days later Pápai Páriz wrote to his Hungarian Maecenas Count Sándor Teleki, that Sérczi “has just left the Netherlands” [Peregrinus 17].